Madrid is a very old city, its documented history dates back to the 9th century. Therefore, the city is filled with beautiful historic elements, such as old squares, buildings, monuments and statues. We would like to dedicate this month´s blog to the special monuments and statues located in the city of Madrid. If you are into history and love learning about monuments and statues, keep reading! And when visiting Madrid, take this blog with you and visit all monuments and statues we mentioned to see them for yourself. It is not a surprise that the first statue we are writing about is El Oso y el Madroño, the statue of the bear with the madroño tree. It is located on the square of Puerta del Sol, in the heart of the city center of Madrid. This statue represents the symbol of Madrid, so you will also see it back in the weapon of the community of Madrid. A long time ago, the forests that surrounded Madrid were filled with bears and with madroño trees. 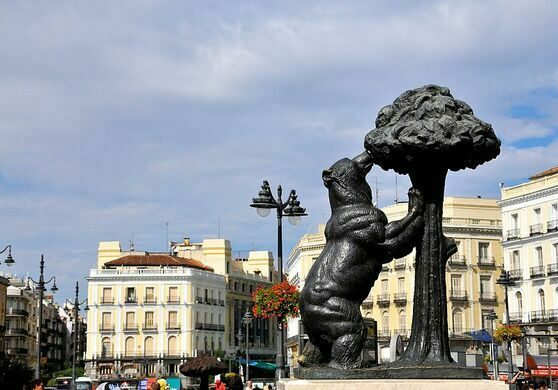 The bears loved to eat the fruits of the madroño trees and that is how Madrid got its symbol. In the city center of Madrid, around the touristic areas, you can find many bars that serve liquor de madroño. This is a liquor made of the madroño, which is a red fruit and family of the cranberry, and it tastes very sweet. Located in the south of the Retiro park you can find the statue El Angel Caido, in English ¨The Fallen Angel¨. Not many locals in Madrid know about this statue, but its story is so interesting that we really want to share it with you. The statue of El Angel Caido represents Lucifer during his expulsion from Heaven. Also, people who believe in evil think it is a gateway to Hell. This theory is supported by the fact that the statue is located 666 meters above sea level. On the other side, El Angel Caido is much more than just a superstition. It in an important aspect of the Retiro Park and one of the most valued artworks of Ricardo Bellver. The statue shows Lucifer falling from the sky, with snakes tangled around his arms and legs, pulling him down. It won the national prize of sculptures and was shown during the universal exposition in Paris, just four years after its creation. When walking down Calle Mayor, just meters from the square of Puerta del Sol, you can find the statue of El Angel Estrellado. Some people also call it ¨el otro angel caido de Madrid¨, in English: the other fallen angel. It is situated on top of a corner-building of the street Calle de los Milaneses. The statue is made of bronze and shows the actual size, or perhaps even slightly bigger, of a body of an angel that collapsed into the attic of the building. The story is very simple; this angel just had an accident and crashed into the roof of a building in the city center of Madrid. 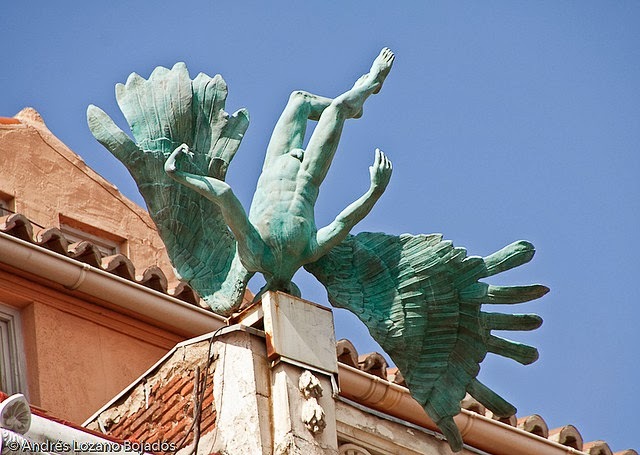 Its artist is Miguel Ángel Ruiz Beato who called the statue ¨Accidente Aéreo¨, which means air accident. The statue, due to its material, weighs over 300 kilos. The fountain of Cibeles is located on the square of Plaza Cibeles, surrounded with four beautiful buildings: Palacio de Buenavista (army general headquarters), Palacio de Linares (Casa de América), Palacio de Comunicaciones (formerly the post office and now the town hall of Madrid) and Banco de España (Spanish Bank). Hence, if you visit La Cibeles you will have loads of other gorgeous architecture to see. 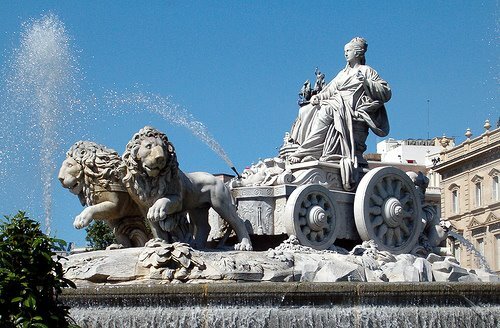 The fountain of Cibeles was created in 1782 and shows the Roman goddess Cibeles, symbol of earth, agriculture and fertility. She is sitting on a carriage which is pulled by two lions, which represent the two mythical characters Hipómenes and Atalanta. The goddess and lions are made of marble and the rest of the fountain is made of stone. In addition, there is a legend that says that if you would dig below the fountain of Cibeles, you would get to the gold of Banco de España, the Spanish Bank which is located just in front of the fountain. The goddess of Cibeles is also an icon for the fans of the football team, Real Madrid. After winning a cup, the players of Real Madrid visit the fountain to celebrate, as well as the Spanish national team. As you see, you cannot leave Madrid without seeing La Cibeles in person. Madrid has many statues of ¨important¨ and historical figures on horses. A fun fact: the position of the legs of the horse tells you the way the person, sitting on top of it, died. If the horse has all 4 legs on the ground, the person died of natural causes, if the horse has one leg in the air, the person died of wounds obtained during combat and if the horse has two legs in the air, the person died during combat. In other words, the position of the legs of the horse shows if the person was brave and died like a hero. Located on Plaza Mayor, one of the most important squares of the city center of Madrid, you can find the statue of Felipe III. Felipe III was the first Spanish king that was born in Madrid, in 1578. You can see that the horse is holding one leg in the air, which means that Felipe III died of wounds obtained during combat, but actually Felipe III died of a disease, which means his horse should have all legs on the ground. Apparently, he wanted people to think he died as a braver man than he actually was. The real reason we mention this statue in our blog is because of something strange that happened to it. If you look closely, you can see that the belly of the horse is strangely big. What happened is that during a period of time birds flew into the open mouth of the horse and went into its hollow belly. As they could not find their way out, they would eventually die. People, who heard the noises from the birds inside the statue, thought its surrounding was haunted, as many people were executed on Plaza Mayor back in the days. One day, close to new year’s, a person inserted firework into the statue and, as the horse´s belly was filled with rotten bird-corpses, the belly exploded, showing the corpses of the birds. The mystery about the ghosts was solved, the mouth of the horse was closed, and the belly was restored. To all of you, who went to school and actually did their homework, the name Miguel de Cervantes must sound familiar. For the ones who skipped school; Cervantes was a Spanish novelist, playwright and poet and, above all, very famous for creating Don Quixote, one of the most important books of all times and the first modern novel. The story of Don Quixote is about a man, who called himself Don Quixote, who left his hometown in La Mancha to go on a quest for adventure. Together with his companion Sancho Panza, Don Quixote started his journey while experiencing different comedic misadventures. The Monumento to Cervantes was created in different parts over time. 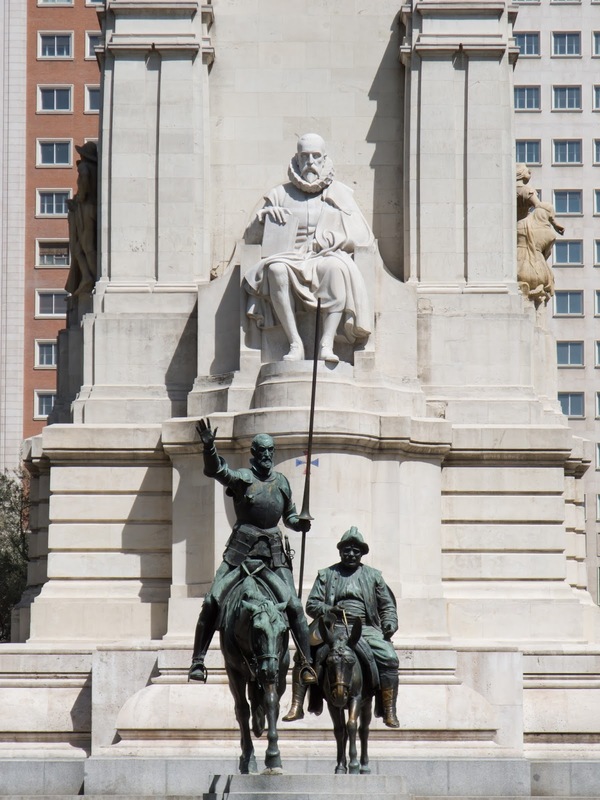 The monument consists of different statues, but the most important ones are the two bronze statues of Don Quicote and Sancho Panza in the front and, behind them, the large statue of Cervantes holding a copy of the book about Don Quixote. Perhaps you are already organizing your trip to Madrid and planning on visiting the Prado Museum? If this is the case, you should definitely visit the statue of the famous painter Goya. Francisco Goya, who was born in 1746, was a Spanish romantic painter and printmaker. He is considered one of the most important Spanish artists from his time. He was also awarded the title of ¨first painter of the king¨. By the age of 47 Goya was deafened due to an illness. After this tragic event, Goya his style changed and showed more loneliness, fear and alienation. Nevertheless, his paintings are truly beautiful. Some of our favorites are ¨La pradera de San Isidro¨ (hanging in the Prado Museum) and ¨El aquelarre¨ (Hanging in the Lazaro Galdiano Museum). Monumento a Goya (Monument to Goya) have had three different locations here in Madrid; in 1902 the statue was installed on Paso de Coches del Retiro, inside of the Retiro park. Three years later the monument was moved to Calle Goya, a street named after the famous painter and in 1945 it was placed on its current location; just in front of the Prado Museum. Do not forget to pay your respects to Goya when visiting the Prado Museum. Our name for these statues is ¨Los bebes de Atocha¨, which means the babies of Atocha, but the official name of the two baby-head-statues, is ¨Dia y Noche¨, which means day and night. We have chosen to include the two statues because the story behind the heads is very sweet and they are very surprising to encounter. Antonio López is the artists who created the two heads. The story is that when one of his granddaughters was born, he felt a very strong connection with her. Therefore, he decided to take her face and create two versions of it; one is with here eyes very wide open, which represents day-time, and the other one is with her eyes closed while sleeping, which represents the night. In 2002, the statues were placed next to the train station of Atocha Renfe with the goal of modernizing and renovating this important station in Madrid. 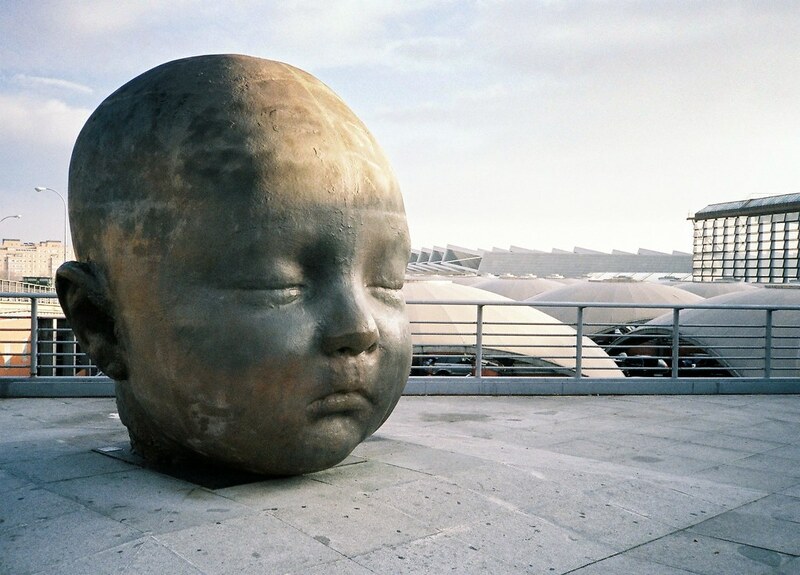 Therefore, for all who are arriving to- or department from Madrid, we recommend you look around when exiting or entering the station to find these enormous heads of the cutest face of a baby. In the middle between two busy roads and located almost on the hectic Plaza Colon (Columbus Square) you can find the statue called ¨Mujer con Espejo¨, which means woman with mirror. She is completely naked, made out of bronze and weighs over one thousand kilos. Her creator, Fernando Botero, gave the statue as a present to Madrid in the year 1994. Fernando Botero Angulo is a painter and sculptor from Colombia. He also created other sculptures for Madrid, such as La Mano (Plaza de San Juan de la Cruz) and El Rapto de Europa (Terminal 1, Aeropuerto Adolfo Suarez de Barajas). Mujer con Espejo is also known, amongst the people from Madrid, as ¨Gordas Botero¨, which means ¨Fatties of Botero¨. Although the people of Madrid use the plural of fat, Botero says he has never painted or sculptured a fat person in his life. He says he created the voluminous body of Mujer con Espejo to show sensuality. The women of Mujer con Espejo is lying face down, with her head tilted towards the statue of Christopher Columbus, who is standing in the middle of Columbus Square. With her right hand she is stroking her hair in a flirty way and in her left hand she is holding a mirror in which she is not looking. When in Madrid, just pay her a visit. You will enjoy seeing this massive statue in real life. The first one is ¨Lectora Empedernida¨, which means inveterate reader. You can find her sitting on one of the benches of Plaza Dos de Mayo since 1999. On Plaza San Ildefonso you can find the second one, called ¨Joven Caminando¨, which means the young one walking. This statue has been here since 1996 and shows a typical young student, walking with her backpack and binder. Almost on the corner of Calle Pez and Calle San Bernardo you can visit the third and, at the same time, our favorite statue called Julia. She is the last statue that came to the neighborhood in 2003. The story tells that in the 19th century Julia went as a student to the Central University in Calle San Bernardo. At that time only boys where aloud to study at the university, so Julia dressed up as a boy and also went. The fourth- and last bronze statue is called ¨Paseante¨ which means stroller or walker. Behind her you can find the School of Arts, located on Calle Palma number 46. Due to her location people believe she used to be a student at this school. The neighborhood of Malasaña wanted to upgrade its urban landscape and therefore started a contest, in which the students of the School of Arts participated, to obtain ideas. The winners of the contest are the creators of the Vecinas de Bronce. You are coming to the end of this month its blog article. We hope we were able to entertain you, teach you, but most of all, made you enthusiastic to come to Madrid in order to visit all statues in person. Please, do not forget that for anything you might need in Madrid or any questions you might have about our Hostel, you can always contact us by writing to info@mad4youhostel.com or give us a call at 0034 915 217 549. We are more than happy to help with whatever you might need. to see all our posts about Mad4You and things happening in- and around the city of Madrid. Hope to see you soon at Mad4You Hostel!